Forest River’s new policy: Good news or an idiot’s tale? 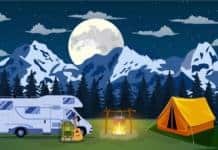 Perhaps it’s a coincidence, or maybe there really is an RV manufacturer that’s “seen the light” and wants to do something to make peace with the RVing community. Whatever the case, a new move by RV giant Forest River has created a bunch of “unhappy campers” among the ranks of its dealers. Where it gets even more interesting is another reason for mandated contact with the factory. A report must be made “whenever the vehicle has been in repair for seven or more days, whether at one dealer or in combination with other dealers, for an issue that may substantially impair the use, market-value or safety of the vehicle.” [emphasis ours] Of interest, most states that have applicable Lemon Laws kick in when a vehicle is grounded for service for up to 30 days. Putting the heat on local dealers, Forest River rounds out its new commandments with the following punishments for ignoring the protocols: “To the full extent permitted by law, Forest River reserves the right to withhold dealer indemnification if dealer fails to comply with any of the dealer requirements in this addendum.” In other words, do what we say, or don’t expect to get refunded for your parts and labor, and if the customer sues, don’t expect us to back you up. 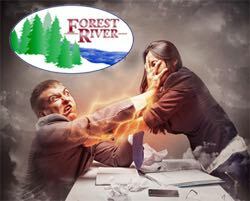 According to a story published by rvdailyreport.com, many Forest River dealers are taking umbrage with the new policy. Arguably, it appears on the surface that Forest River may be feeling the wrath of consumers who are fed up with spending their days not out RVing, but pacing the floor waiting for a phone call to come and pick up their repaired rig. 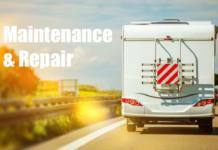 But dealers are incensed, some saying that the problem with long warranty repair delays is a matter of the company failing to provide repair parts in a timely way, and often shipping the wrong parts in the first place. How this internal war will shake out between Forest River and its dealers remains to be seen. But for Forest River customers, the big question is this: Does this new policy mean a weather-change that could actually lead to positive changes in customer support? Or will it simply be, like Macbeth’s idiot’s tale, “full of sound and fury, signifying nothing”? Previous articlePlan to RV this Memorial Day weekend? Forest River is owned by Warren Buffet’s company Birkshire Hathaway. Warren Buffet has always preached about being honest and companies he owns are run well. I would suggest finding a way to get his attention about the problems with Forest River. Years ago I toured the Western RV plant, maker of Alpenlite products. The thing that sold me was the last person on the assembly line had a checklist and gummed color dots. Several hours later the unit would be reinserted back into the assembly line to rectify the problems before being sent out to the dealers. Years later, the dealers took over that function, and shortly afterward WRV folded. While other factors came into play, the lack of quality control at the factory is always telling. I agree if manufacturers would do there own pre- delivery inspections, dealers wouldn’t have so many warrenty issues. Also my dealer must wait for authorization on all warrenty repairs & part ordering before any work is done. So You bring your rv in & a week or 2 goes by waiting for authorization, then another week or 2 for parts, before work is ever started. Not to say dealers are not to blame for not having enough Qualified Technicians (not just warm bodies in the shop) to do the requied work. Sometimes it IS the dealer’s fault. I had our rig in for warranty work and it stayed there for 90 days (fortunately I didn’t need it at the time). Out of 13 items, 3 were repaired. Dealer stated they did not get parts from FR. I contacted FR and they stated they had no record of the dealer contacting them of warranty work or parts required. FR contacted the company and my rig went back to the dealer. 3 days later all warranty work was done. I do not trust dealers anymore. Sounds like too little too late. Just build a quality product in the first place already ! People won’t mind paying for that quality if it is REAL! so true, just build it right the first time. This could be a good thing, but I can see this backfireing. I can see dealers just dropping the brand altogether. Then what happens? Forest River is the largest manufacturer of RV’s I believe. So just dropping them is really not an option for many dealerships. Just maybe forest river is actually trying to find where the problems are being created whether on the manufacturing side or the dealer itself. I read so much about dealers not helping people and delivering a unit that IS NOT prepped properly. I’ve had forest river products before and mine have always been really great units!!!! With your idea, I do believe the manufacturers would start producing a “good” product. The problem I see is they would raise prices to pay for it. It would not cost the dealer more money, but it sure would you. Presumably the dealer will make the call on this, and they can simply say it does not fit this requirement. So Forest river builds junk, then puts the onus on dealers to make timely fixes, while paying them half the going rate for their work. So the dealer is “rushed” to make a fix, but worries about it “coming back on them”, while using unqualified workers because they are cheaper. I expect there will be fewer FR dealers after this. Just one more reason why I performed 20+ hours of “warranty work” on my new trailer on my own because because going into the dealer/warranty grinder just wasn’t going to happen.